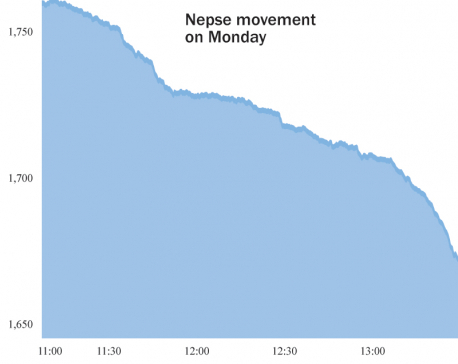 KATHMANDU, June 13: Nepal Stock Exchange (Nepse) index saw a marginal decline of 1.93 points to close at 1,239.26 points on Tuesday. Though the initial slump was followed by midday recovery, it reflects a lack of conviction. The stock market failed to hold on previous day's gains as uncertainty about the direction of the market still looms large among investors. Hence, the total turnover also dropped by 31.22 percent compared to the previous day. A total of Rs 302 million worth of shares were traded on the day. Sub-indices turned in mixed performance on Tuesday. Finance Sub-Index edged up 0.35 percent and the sub-indices of Manufacturing & Processing and Insurance sector also ended the day higher. However, Hotel stocks were under pressure as reflected by a 0.78 percent decline in Hotel Sub-index. Banking Sub-index also shed 0.28 percent. Furthermore, the sub-indices of Hydropower, Microfinance and Development Bank also ended in red. 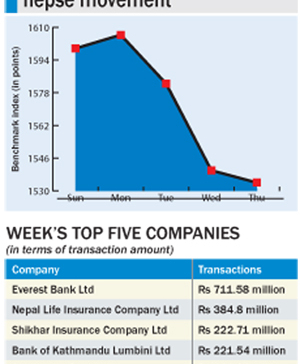 In terms of market activity, shares of Nepal Life Insurance Company Ltd recorded the highest turnover of over Rs 23 million. Best Finance Company Ltd (Promoter Share) was second with total transactions of over Rs 15 million. Next on the list were shares of Mega Bank Ltd, Nepal Telecom Ltd and Sana Kisan Bikas Bank Ltd.
Unnati Microfinance Bittiya Sanstha Ltd secured its place as the top gainer for third straight day row. Its share price leapt by almost 10 percent. Similarly, shares of Radhi Bidyut Company Ltd went up by over 7 percent. Ngadi Group Power Ltd, Mero Microfinance Bittiya Sanstha Ltd and Jalabidyut Lagani Tatha Bikas Co Ltd also saw their share prices rise by about 4 percent each. 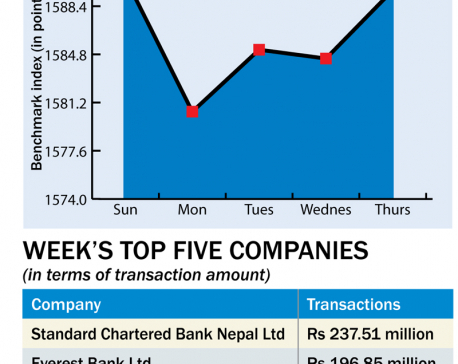 Conversely, Kabeli Bikas Bank Ltd was the worst performer of the day as its share price fell by over 6 percent. Shares of Arun Valley Hydropower Development Co Ltd went down by 5.95 percent. Everest Bank Ltd (Convertible Preference Share) continued its decline, dropping over 3 percent. In corporate news, RSDC Laghubitta Bittiya Sanstha Ltd is due to issue 60 percent right shares to its shareholder from July 1. Further, Siddhartha Insurance Ltd is also set to launch 35 percent rights issue from the same date. The paid up capital of the companies will reach Rs 576 million and Rs 864 million, respectively, after the rights issue. ARKS technical analysis model indicates a small bearish candlestick formation on daily timeframe. Hence, the index hasn't shown any movement on Tuesday's trading session. The index is trading way below 20-day and 5-day exponential moving average (EMA), indicating a short-term downtrend in action. Relative Strength Index (RSI) remained close to the oversold territory as selling pressure is yet to ease off. Further, Moving Average Convergence/Divergence (MACD) continued its fall to the negative territory, indicating continuation of bearish momentum. Hence, if the market falls further, there is a possibility of the Nepse index testing the support level of 1,200 points.